Michelson-Morley Experiment Tested Einstein's Theories On Light. Michelson-Morley experiment tried to measure the aether. The Michelson-Morley experiment, is one of the most important and famous experiments in the history of physics. The Michelson-Morley experiment was performed in 1887 by Albert Michelson and Edward Morley at what is now Case Western Reserve University. The Michelson-Morley experiment is generally considered to be the first strong evidence against the theory of a luminiferous aether. Primarily for this work, Albert Michelson was awarded the Nobel Prize in 1907. A depiction of the concept of the "aether wind." Physics theories of the late 19th century postulated that, just as water waves must have a medium to move across (water), and audible sound waves require a medium to move through (air), so also light waves require a medium, the "luminiferous aether." The speed of light being so great, designing an experiment to detect the presence and properties of this aether took considerable thought. Michelson-Morley experiment tried to measure the ether. Each year, the Earth travels a tremendous distance in its orbit around the sun, at a speed of around 30 km/second, over 100,000 km per hour. The Sun itself is travelling about the galactic center at speeds estimated to be between 217 to 250 km/s, and the Galaxy itself is at motion relative to other Galaxies (although such concepts of galactic and universal architecture were unknown to nineteenth century astronomers.) It was reasoned that the Earth would at all times be moving through the aether, thus producing a detectable "aether wind." At any given point on the Earth’s surface, the magnitude and direction of the wind would vary with time of day and season, at least as much (but probably more) as relative to the Solar System. 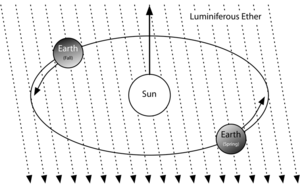 By analysing the return speed of light in different directions at various different times, it was thought to be possible to detect the motion of the Earth relative to the aether. The effect of the aether wind on light waves would be like the effect of wind on sound waves. Sound waves travel at a constant speed relative to the medium that they are travelling through. This speed varies depending on the barometric pressure, air temperature etc., but is typically around 340 m/s in air at sea level. So, if the speed of sound in our conditions is 340 m/s, when there is a 10 m/s wind relative to the ground then the entire vibrating mass of air is moving relative to the ground. When one is travelling over the ground and into the wind it will appear that sound is travelling at 330 m/s (340 - 10). Downwind, it will appear that sound is travelling at 350 m/s (340 + 10). Measuring the speed of sound when moving across the ground in different directions will therefore enable us to calculate the speed of the air relative to the ground. If the speed of the sound cannot be directly measured, an alternative method is to measure the time that the sound takes to bounce off of a reflector a determined distance away and return to the origin. This measurement is done parallel to the wind and perpendicular to it. (If the direction of the wind is not readily apparent then it may be necessary to make measurements in several directions and compare the results.) The cumulative round trip effects of the wind in two orientations most favors the speed of sound travelling at right angles to it and least favors the speed of sound travelling parallel to it. Similarly, the effect of an aether wind on a beam of light would be for the beam to take slightly longer to travel round-trip in the direction parallel to the "wind" than it would take to travel the same round-trip distance at right angles to it. The expected difference in the measured speed of light, given the velocity of the Earth in its orbit around the sun, was about one hundredth of one percent of the speed of light. Using the apparatus of Fizeau would require an extremely high level of precision. But for the purpose of detecting the presence of a presumed aether flow it is necessary only to detect that light beams travelling in two directions are going at different speeds. If we had only a lumber store yard stick and wanted to determine which of two "twelve foot boards" was the longer, we might not be able to arrive at a decision because each measurement of board length would involve errors the might be larger than the actual difference in the lengths of the boards. However, placing them standing together on a smooth level surface it would be immediately clear if there was a difference of even one hundredth of an inch. Albert Abraham Michelson and Morley used a similar "zero point" method. and they used the fact that two beams of light that were originally in phase (or were actually the same beam) would not continue to be in phase if they travelled different lengths and then were brought back side by side again. Bringing the two beams into coincidence would result in the presence of an interference pattern unless the paths followed by the two beams were exactly the same. The Michelson-Morley apparatus involved splitting a beam of light and making it travel paths perpendicular to each other. The practical task to making such an apparatus equal in the two perpendicular dimensions to a degree of accuracy equal to the wavelength of light would have been forbidding. One symptom of having failed to achieve that degree of precision would be the appearance of an interference pattern on the final viewing detector of the apparatus. The characteristics of the interference pattern would be a function of the difference in the lengths of the two arms of the apparatus. If the presence of an aether current in some direction retarded or sped the passage of light, then the interference pattern observed would change as the entire apparatus was slowly rotated and first one and then the other axis of the apparatus went parallel to the direction of the aether flow. Much to everyone's surprise, when rotated the interference pattern failed to exhibit the expected change, which threw the theory of aether current into question. Though using a contemporary laser, this Michelson interferometer is the same in principle as those used in the original experiment. Michelson had a solution to the problem of how to construct a device sufficiently accurate to detect aether flow. The device he designed, later known as an interferometer, sent a single source of white light through a half-silvered mirror that was used to split it into two beams travelling at right angles to one another. After leaving the splitter, the beams travelled out to the ends of long arms where they were reflected back into the middle on small mirrors. They then recombined on the far side of the splitter in an eyepiece, producing a pattern of constructive and destructive interference based on the length of the arms. Any slight change in the amount of time the beams spent in transit would then be observed as a shift in the positions of the interference fringes. If the aether were stationary relative to the sun, then the Earth’s motion would produce a fringe shift one twenty-fifth the size of a single fringe. Michelson had made several measurements with an experimental device in 1881, in which he noticed that the expected shift of 0.04 was not seen, and a smaller shift of about 0.02 was. However his apparatus was a prototype, and had experimental errors far too large to say anything about the aether wind. For a measurement of the aether wind, a much more accurate and tightly controlled experiment would have to be carried out. The prototype was, however, successful in demonstrating that the basic method was feasible. He then combined efforts with Edward Morley and spent a considerable amount of time and money creating an improved version with more than enough accuracy to detect the drift. In their experiment, the light was repeatedly reflected back and forth along the arms, increasing the path length to 11 m. At this length, the drift would be about 0.4 fringes. To make that easily detectable, the apparatus was located in a closed room in the basement of a stone building, eliminating most thermal and vibrational effects. Vibrations were further reduced by building the apparatus on top of a huge block of marble, which was then floated in a pool of mercury. They calculated that effects of about 1/100th of a fringe would be detectable. The Mercury pool allowed the device to be turned, so that it could be rotated through the entire range of possible angles to the "aether wind." Even over a short period of time some sort of effect would be noticed simply by rotating the device, such that one arm rotated into the direction of the wind and the other away. Over longer periods day/night cycles or yearly cycles would also be easily measurable. During each full rotation of the device, each arm would be parallel to the wind twice (facing into and away from the wind) and perpendicular to the wind twice. This effect would show readings in a sine wave formation with two peaks and two troughs. Additionally, if the wind were only from Earth’s orbit around the sun, the wind would fully change directions east/west during a 12 hour period. In this ideal conceptualization, the sine wave of day/night readings would be of opposing phase. Because it was assumed that the motion of the Earth around the Sun would cause an additional component to the wind, the yearly cycles would be detectable as an alteration of the magnitude of the wind. An example of this effect is a helicopter flying forward. While hovering, a helicopter’s blades would be measured as travelling around typically at 300 mph at the tips. However, if the helicopter is travelling forward at 150 mph, there are points where the tips of the blades are travelling through the air at 150 mph (downwind) and 450 mph (upwind). The same effect would cause the magnitude of an ether wind to decrease and increase on a yearly basis. Ironically, after all this thought and preparation, the experiment became what might be called the most famous failed experiment to date. Instead of providing insight into the properties of the aether, Michelson and Morley’s 1887 article in the American Journal of Science reported the measurement to be as small as one-fortieth of the expected displacement but "since the displacement is proportional to the square of the velocity" they concluded that the measured velocity was approximately one-sixth of the expected velocity of the Earth’s motion in orbit and "certainly less than one-fourth." Although this small "velocity" was measured, it was considered far too small to be used as evidence of aether, it was later said to be within the range of an experimental error that would allow the speed to actually be zero. Although Michelson and Morley went on to different experiments after their first publication in 1887, both remained active in the field. Other versions of the experiment were carried out with increasing sophistication. Kennedy and Illingworth both modified the mirrors to include a half-wave "step," eliminating the possibility of some sort of standing wave pattern within the apparatus. Illingworth could detect changes on the order of 1/300th of a fringe, Kennedy up to 1/1500th. Miller later built a non-magnetic device to eliminate magnetostriction, while Michelson built one of non-expanding invar to eliminate any remaining thermal effects. Others from around the world increased accuracy, eliminated possible side effects, or both. All of these, with the exception of Dayton Miller’s, also returned what is considered a null result. Morley was not convinced of his own results, and went on to conduct additional experiments with Dayton Miller. Miller worked on increasingly large experiments, culminating in one with a 32 m (effective) arm length at an installation at the Mount Wilson observatory. To avoid the possibility of the aether wind being blocked by solid walls, he used a special shed with thin walls, mainly of canvas. He consistently measured a small positive effect that varied, as expected, with each rotation of the device, the sidereal day and on a yearly basis. The low magnitude of the results he attributed to aether entrainment (see below). His measurements amounted to only ~10 kps instead of the expected ~30 kps expected from the earth's orbital motion alone. He remained convinced this was due to partial entrainment, though he did not attempt a detailed explanation. Though Kennedy later also carried out an experiment at Mount Wilson, finding 1/10 the drift measured by Miller, and no seasonal effects, Miller’s findings were considered important at the time, and were discussed by Michelson, Lorentz and others at a meeting reported in 1928 (ref below). There was general agreement that more experimentation was needed to check Miller’s results. Lorentz recognised that the results, whatever their cause, did not quite tally with either his or Einstein’s versions of special relativity. Einstein was not present at the meeting and felt the results could be dismissed as experimental error. In recent times versions of the MM experiment have become commonplace. Lasers and masers amplify light by repeatedly bouncing it back and forth inside a carefully tuned cavity, thereby inducing high-energy atoms in the cavity to give off more light. The result is an effective path length of kilometers. Better yet, the light emitted in one cavity can be used to start the same cascade in another set at right angles, thereby creating an interferometer of extreme accuracy. The first such experiment was led by Charles H. Townes, one of the co-creators of the first maser. Their 1958 experiment put an upper limit on drift, including any possible experimental errors, of only 30 m/s. In 1974 a repeat with accurate lasers in the triangular Trimmer experiment reduced this to 0.025 m/s, and included tests of entrainment by placing one leg in glass. In 1979 the Brillet-Hall experiment put an upper limit of 30 m/s for any one direction, but reduced this to only 0.000001 m/s for a two-direction case (i.e., still or partially entrained aether). A year long repeat known as Hils and Hall, published in 1990, reduced the limit of anisotropy to 2x10-13. This result was rather astounding and not explainable by the then-current theory of wave propagation in a static aether. Several explanations were attempted, among them, that the experiment had a hidden flaw (apparently Michelson’s initial belief), or that the Earth’s gravitational field somehow "dragged" the aether around with it in such a way as locally to eliminate its effect. Miller would have argued that, in most if not all experiments other than his own, there was little possibility of detecting an aether wind since it was almost completely blocked out by the laboratory walls or by the apparatus itself. Be this as it may, the idea of a simple aether, what became known as the First Postulate, had been dealt a serious blow. A number of experiments were carried out to investigate the concept of aether dragging, or entrainment. The most convincing was carried out by Hamar, who placed one arm of the interferometer between two huge lead blocks. If aether were dragged by mass, the blocks would, it was theorised, have been enough to cause a visible effect. Once again, no effect was seen. Walter Ritz’s emitter theory (or ballistic theory), was also consistent with the results of the experiment, not requiring aether, more intuitive and paradox-free. This became known as the Second Postulate. However it also led to several "obvious" optical effects that were not seen in astronomical photographs, notably in observations of binary stars in which the light from the two stars could be measured in an interferometer. The Sagnac experiment placed the MM apparatus on a constantly rotating turntable. In doing so any ballistic theories such as Ritz’s could be tested directly, as the light going one way around the device would have different length to travel than light going the other way (the eyepiece and mirrors would be moving toward/away from the light). In Ritz’s theory there would be no shift, because the net velocity between the light source and detector was zero (they were both mounted on the turntable). However in this case an effect was seen, thereby eliminating any simple ballistic theory. This fringe-shift effect is used today in laser gyroscopes. Another possible solution was found in the Fitzgerald-Lorentz contraction. According to this hypothesis all objects physically contract along the line of motion relative to the aether, so while the light may indeed transit slower on that arm, it also ends up travelling a shorter distance that exactly cancels out the drift. In 1932 the Kennedy-Thorndike experiment modified the Michelson-Morley experiment by making the path lengths of the split beam unequal, with one arm being very short. In this version the two ends of the experiment were at different velocities due to the rotation of the earth, so the contraction would not "work out" to exactly cancel the result unless time dilation takes place. Once again, no effect was seen, which they presented as evidence for time dilation. Ernst Mach was among the first physicists to suggest that the experiment actually amounted to a disproof of the aether theory. Einstein derived the Fitzgerald-Lorentz contraction from the relativity postulate; thus his description of special relativity was also consistent with the apparently null results of most experiments (though not, as was recognised at the 1928 meeting, with Miller’s observed seasonal effects). Today special relativity is generally considered the "solution" to the MM null result. The Trouton-Noble experiment is regarded as the electrostatic equivalent of the Michelson-Morley optical experiment, though whether or not it can ever be done with the necessary sensitivity is debatable. On the other hand, the 1908 Trouton-Rankine experiment, which can be regarded as the electrical equivalent to the Kennedy-Thorndike experiment, achieved an incredible sensitivity. 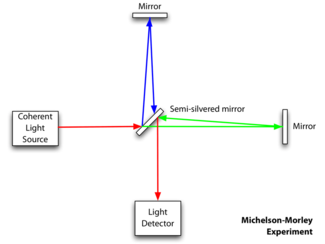 Michelson-Morley Experiment: New Considerations and interpretations. Science continually questions itself and allows room for reasonable doubt. This is the reason why there are still experiments very similar to this one being performed by credible institutions today, over 100 years later. Two very well accepted pillars of science, quantum physics and relativity, are still somewhat incompatible under certain circumstances. The most well-known attempt to unify these two theories is a test theory presented by Robertson, Mansouri and Sexl. It is known as the Standard Model Extension or SME. For the two theories to be compatible, one of them must bend. It is for this reason that these newer experiments search for Local Lorentz Invariance (LLI) violations. An experiment which proves light speed anisotropy is one experiment that would constitute a violation. "...More careful reflection teaches us, however, that the special theory of relativity does not compel us to deny ether. We may assume the existence of an ether... Recapitulating, we may say that according to the general theory of relativity space is endowed with physical qualities; in this sense, therefore, there exists an ether... According to the general theory of relativity space without ether is unthinkable; for in such space there not only would be no propagation of light, but also no possibility of existence for standards of space and time (measuring-rods and clocks), nor therefore any space-time intervals in the physical sense. But this ether may not be thought of as endowed with the quality characteristic of ponderable media, as consisting of parts which may be tracked through time. The idea of motion may not be applied to it." A phenomenon known as the Lense-Thirring effect or frame-dragging is a prediction of GR in which the space-time near a massive object is entrained, or dragged along with the object. The December 2005 issue of Scientific American discusses the use of acoustic models and the study of the Hawking Effect to show how black holes give evidence of a space that behaves in a very fluid-like fashion. As early as 1933 in "Reviews of Modern Physics", Dayton Miller showed that while the Michelson-Morley experiment’s readings were far lower than expected, it did in fact contain a systematic sine-wave of readings as expected of an ether drift. Additionally he pointed out that the commonly accepted null result is only arrived at by prior assumption of a specific direction for the wind combined with the lack of consideration of temperature effects. When temperature drift is factored out and no bias is considered for wind direction, the 1887 experiment shows a fringe shift approximately equivalent to the 10 kps found in Miller’s experiments. when s and are arbitrary functions of the velocity of translation v, with the only conditions that for v = 0: = 0 and s = c.
Michelson-Morley experiment application to gravitational wave detection. Amongst the predictions of Einstein’s later general theory of relativity is that there exist gravitational waves, but as of 2006, these waves have only been indirectly observed. Enormously sensitive, kilometer-scale Michelson interferometers are used in current projects attempting to directly detect gravitational waves, such as LIGO and VIRGO. LISA is a planned joint NASA-ESA mission to put three 5 million kilometer Michelson interferometers in space, with the intent of observing significantly lower-frequency gravitational waves than terrestrial predecessors.